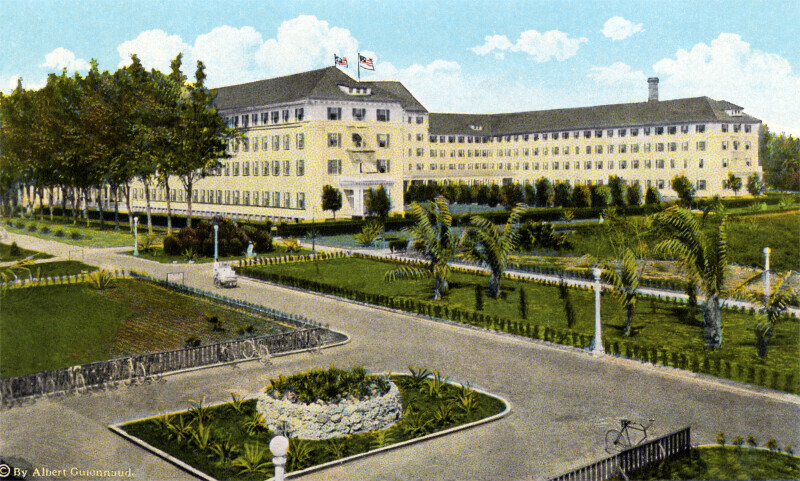 This image shows the front entrance to the Breakers Hotel. The hotel is a four-and-a-half story building, with a hipped roof. There are shed style dormers on the roof, although only three are visible in this image. The area in front of the hotel is landscaped. There are deciduous trees growing to the side of the hotel, and small shrubs line the front of the building. There are people being driven around the grounds, on bicycle chairs. There are bicycle racks, near the bottom edge of the image, and many bicycles are stored on the racks.